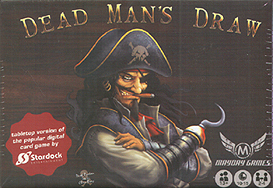 In Dead Man's Draw press your luck as a pirate trying to amass the most booty. But here's the catch, get too greedy, and you could lose it all! Players draw cards one at a time trying to collect the most loot, comprised of ten suits with six cards each. Draw different suits and your treasure grows, but get two of the same suit, you Bust and your turn is over. Each suit has a special ability which are the key to success in Dead Man’s Draw, and they build off of each other. What will it be, Matey?